Need a little extra range? Ronan, one of my fellow i3 owners here in Dublin had some issues reaching his place in the country with the drop in range over the winter. There are now CCS rapid chargers on his route but unfortunately he didn't spec the DC Fast Charge Prep. So he hatched a plan to use his EVSE with a pair of marine batteries and inverters to add an extra 10-15km to his range. Loss from the marine batteries to the i3's battery is in the region of 40-50%... but if you need just a few extra km it's an option. Re: Need a little extra range? Any options for a battery that connects to the cigarette lighter adapter and adds just a little more juice? This could be used while driving and make sure that it only discharges, unless the car is charging. There's a service warning to NOT try to charge the 12vdc battery unless you disconnect the HV battery from it, so no, nothing you could add to the socket would do anything. Plus, the wiring is quite small and the fuse, thus the amount of current you could provide wouldn't really do much of anything except damage the car. Powerfool wrote: Any options for a battery that connects to the cigarette lighter adapter and adds just a little more juice? This could be used while driving and make sure that it only discharges, unless the car is charging. The DC-DC charger that chargers the 12 V battery with power from the Li-ion battery pack is a one-way device, so charging the 12 V battery would not charge the Li-ion battery pack. I suppose charging the 12 V battery via the auxiliary power port could reduce the power taken from the Li-ion battery pack to charge the 12 V battery, but the effect would be unnoticeable. I saw a video on YouTube a while back where a guy replaced his 12v battery with a LiO pack plus capacitor. I don't know if it was an EV, hybrid, or ICE, but it was significantly lighter. I guess you could always get one of the those solar trickle chargers, too, for that. Between those two... maybe you save your self a mile a year, I dunno. Thoughts? I applaud any kind of experimentation like this, but I have to wonder how much range he is loosing with added weight? Is he really going farther? Also the linked article implies he is pulling to the side of the road and charging his batteries with the tailgate open for 30-45 minutes. And this is in the middle of bad winter weather? Is he running the heater during that time? I am forever having to explain to people that electric cars don't have solar panels because the added range from making power would be less than the reduced range from the weight. In any case he really should consider a REx. That seems like a far better solution. I really wish that they just had the ability to have auxiliary batteries that could be added/removed/upgraded as necessary. Maybe just a pack that goes in the cargo area. When you need extra range, add them... when you don't, remove them and drop weight. Powerfool wrote: I really wish that they just had the ability to have auxiliary batteries that could be added/removed/upgraded as necessary. Maybe just a pack that goes in the cargo area. When you need extra range, add them... when you don't, remove them and drop weight. The i3's large format battery cells connected in series makes doing this difficult because the battery pack's output voltage must remain within a certain range. Adding more cells in series would increase the output voltage above what the electronics are designed for. Adding more cells in parallel would maintain the correct output voltage range, but an auxiliary pack would need the same number of cells as are in the standard battery pack connected in parallel, so you'd need to double, triple, quadruple, etc., its capacity and thus weight. Extending the battery pack cooling system to an auxiliary pack would be challenging, especially because the i3's battery pack coolant is pressurized refrigerant rather than the no/low pressure glycol coolant used by other EV manufacturers. 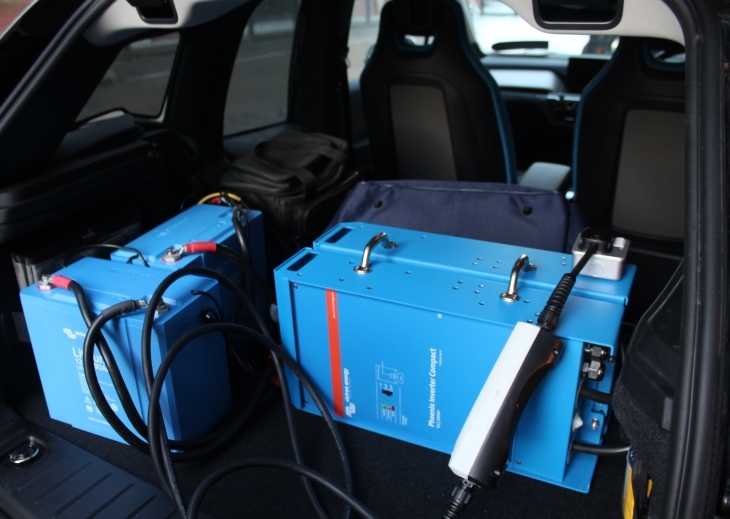 The i3 would need a larger capacity A/C compressor and heat exchangers to deal with the additional heat. Tesla's use of small format battery cells has allowed it to build battery packs of different capacities using different numbers of these cells arranged in various series-parallel configurations. This would make adding an auxiliary pack easier for Tesla. If you wanted to recharge that battery pack via the car's systems, it would get even more technically challenging as the battery balancing logic would need to be hacked, and the algorithm on how large the battery was and managing its temperature would be a major issue as well. I know I sound like a broken record, but the i3 was designed as a city car with limited range. Trying to make it into something it's not, while maybe possible, won't be particularly easy. As battery tech improves, the same space has allowed more range for about the same costs, and BMW has introduced it to the vehicle, increasing its utility to more people. If you happened to live in a market where available, swapping out the battery pack might be viable, but again, at a cost. Probably cheaper than the depreciation to buy a new one, though. I get that these things aren't just easy drop in fixes, I am just saying from a "wish list". Having a battery doesn't require it be in series with the other batteries, it could be used in other ways. None of it optimal, for sure, but doable.